NorthWood’s Northern Lakes Conference win streak hit 50 Thursday night. 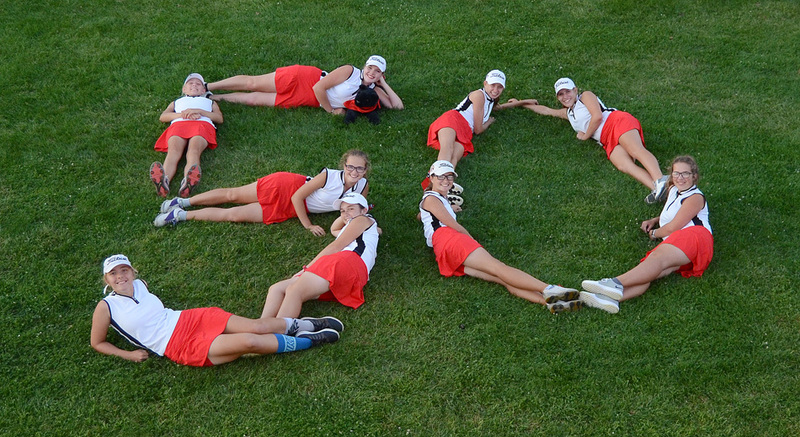 The Lady Panthers shot a 168 to visiting Concord’s 196, and the home team celebrated reaching the half-century mark in a laid-back dual meet on its home course at McCormick Creek. The Lady Panthers were well aware of their program’s streak before their 2018 campaign even began. The unbeaten NLC round robin run, which stretches all the way back to the 2011 season and spans through seven unblemished conference seasons, sat at exactly 43 straight prior to the season, setting the stage for the Panthers to reach the nice, round number with another unbeaten tear through the league’s nine-hole meet schedule. A championship at the NLC Tournament on Saturday, Sept. 8 would secure the 11th-ranked squad sole possession of a seventh straight conference title, a feat unmatched by any other NorthWood program in any IHSAA-sanctioned sport. The Panthers have some margin for error at the tourney, too, as even a runner-up finish would give the team at least a share of the NLC title. 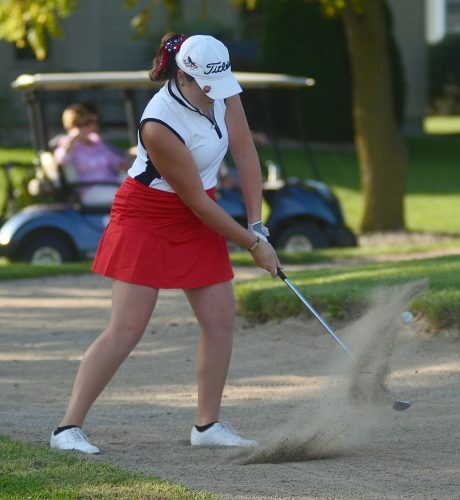 NorthWood senior Abby Slabaugh hits cleanly out of a bunker during Thursday’s meet. The Panthers’ two seniors, MacKenzie Weaver and Abby Slabaugh, have been a part of no less than 28 of their team’s 50 straight NLC wins. The four-year varsity golfers carded 44 and 45, respectively, Thursday, to help earn themselves the distinction of never having been beaten by a conference opponent in nine-hole play. “They’ve both been in the lineup in every single match. Really, we’ve had a lot of really good JV players in our program ever year, and that really pushes our 3, 4 and 5 players to continue to play well and continue to get better. Those two seniors, it’s just a fun ride with them. I hope we have four more weeks with them,” Yoder said. 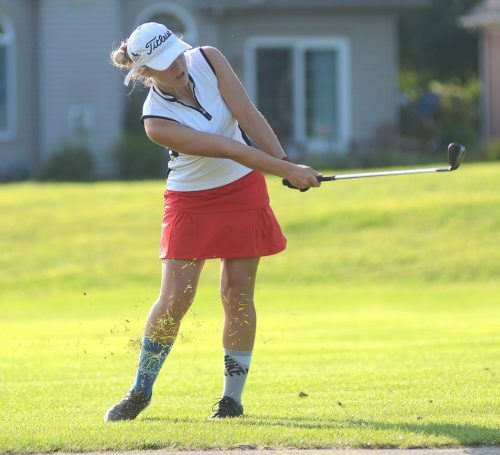 While juniors Delaney Davis and Makenna Gall posted respective scores of 42 and 50 Thursday, the Panthers were led by phenomenal freshman Cybil Stillson, who completed her first unbeaten conference run with a 1-over-par 37. Stillson played nearly scratch golf with bogeys on 6 and 9 and a birdie on McCormick Creek’s par 4 fourth hole. Concord was led by Lauren Boessler’s 44 Thursday, followed by Gracie Tucker’s 49. Jillian Dawson shot 51, Evelyn Theinert carded 52, and Gabby Sponseller turned in a 55 for the team’s toss-out score. MacKenzie Weaver hits a short chip shot Thursday. NorthWood’s JV team also completed an undefeated NLC round robin schedule with a 189 score Thursday, while Concord fielded just three golfers and took an official no score. Leading the Panthers JV was Abigail Richner with a 44, while Kirsten Schrock shot 46, Breanna Goss turned in a 48, and Kylee Gall shot 51. The Panthers varsity moved to 10-0 overall, and they’ll play at ninth-ranked Culver Girls Academy’s invitational Saturday at Swan Lake’s Silver Course in Plymouth, with play scheduled to begin at 1 p.m. The team hosts its Senior Night next Wednesday opposite Mishawaka in advance of the following Saturday’s NLC championships at Black Squirrel in Goshen.